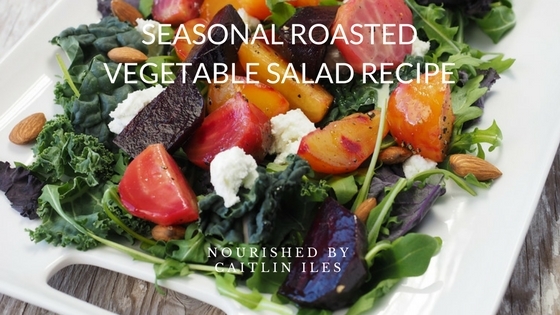 This salad combines delicious roasted root veggies, like beets & yams, with fresh greens, toasted pumpkin seeds, & red onion for a savoury/sweet masterpiece! 3 large beets use different colours for different health benefits and flavours! dressing of choice see options below! Preheat oven to 385F and line a large baking sheet with parchment paper. Wash sweet potatoes and beets. Cut into cubes and place on baking sheet. The smaller you chop them the crispier they will be, so there is a lot of chance to play with texture here. Coat with olive oil, sea salt, and pepper and spread in a single layer. Bake for 15 minutes then remove from oven, stir around, and bake for another 15 minutes until crispy on the edges. While sweets and beets are cooking heat a small frying pan over medium. Add pumpkin seeds and toast until browned and popping, about 5-7 minutes, stirring consistently. You will want to keep your eyes on them so they don't burn. Remove sweets and beets from oven and set aside to cool. Place mixed greens into a large salad bowl. Using a cheese grater, shred the carrot and place in a salad or serving bowl. Dice onion. Add to veggies. Add pumpkin seeds and currants to veggies. Once sweets and beets are cooled, add to serving bowl and mix thoroughly. Top with homemade vinaigrette of choice (see below!). This mixture is also delicious with an added cup or two of cooked quinoa and goat cheese! You could also try using toasted almonds, walnuts, or pecans if pumpkin seeds aren't your jam. Keep them whole or chop them up!